In October 2011, at the ACT New York conference, I heard Dr. Valerie Steele, Director and Chief Curator, the Museum at the Fashion Institute of Technology, present the subject “Is Fashion Art?” The presentation was very interesting and has gotten me thinking more on this subject every since. 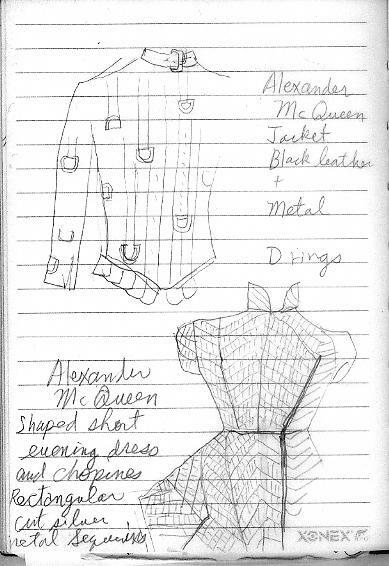 I think if anyone should be called an artist in the fashion field, Alexander McQueen would qualify. His work is definitely a statement of his self and his view. I made these sketches on the same trip, I believe. I visited the Museum at the Fashion Institute, and they happened to have an exhibition with quite a sample of McQueen’s work. Suppose I make a fabric with all that hardware (buckles) dangling? What kind of response would it receive? I drove by an animal lying in the middle of the road yesterday morning. By the time I had passed by I recognized it as a cat instead of a raccoon or a skunk. The worst part was that it was still struggling, not dead. My mind hurt to see her body twisting over and over again and all the cars just speeding by, mine included. The scene remained in my mind for a long time, still visible today when reminded. You are currently viewing the archives for January, 2013 at Woven-Words.